So you’ve took the plunge or perhaps you are still considering camping with a roof top tent. Either way there are some important factors you need to know when camping with a vehicle and an RTT. There are some pros and cons that resonate with SUV tents and Truck Bed Tents, but their are also some that are unique to roof models. Lets dive in and discover that these amazing tents have in store for you after purchase. Roof top tents utilize a very smooth mechanism which allows them to fold up and down really easily and quickly, which can also be managed by 1 person. This is apparent in nearly all the models in our list, top quality roof tents will employ this mechanism to the best of their ability. 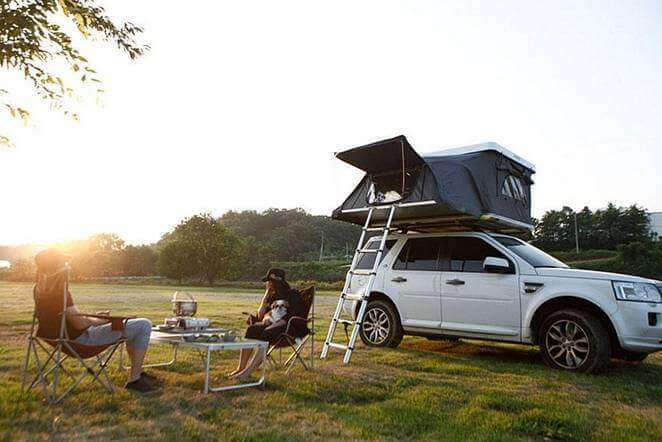 This is undoubtedly a pro and a benefit that makes camping with a roof top tent all the more pleasurable. Not so much a con, but you do need to be aware that although there is a very fast set up after you’ve finished you’re drive, if the weather is hot, the tent compartment may have absorbed a lot of heat. You could be jumping into a sauna as opposed to a roof top tent. Open it up and let it air out a bit first before jumping into to your new home. Additionally they are equally easy to stow away after use, you just push the telescopic ladder back up until it compacts down. The tent itself will have some kind of folding mechanism that will come into play as you push the ladder back up into the tent. Folding down into its storage box tightly and neatly, then just zip up, cover with its protective travel cover and off you go. Now as you may have noticed a lot of the Roof Top Tents are 4 season tents. The main reason for this is the quality and durability of the materials used. They are strong, tough and rugged, to withstand all elements. This is all well and good, but with this strength comes a con, breathability. They do struggle with ventilation somewhat and you can really feel the kick of this during steaming hot days. Indeed there are windows, doors and meshed windows to help in the fight against air circulation, however remember these are usually fitted with a really fine mesh cover, to repel mosquitoes. This can also create resistance against any breeze or airflow, so getting a good air flow going can be quite tricky to say the least. If you’re in a mosquito free zone, fully roll up the mesh to air it out properly. You can expect to pay anything from $1000-$3000 for a roof top tent depending on the design, size and brand name of the tent. Generally speaking $899-$1499 is enough to net an awesome top quality tent and we provide a vast number of choices within this price range. Normally the brand new models or hard shell models will break the $2000+ marker, but the price will fall over time, so depending on your level of patience could affect the amount of money you spend. Now when we compare this to traditional ground tents, this would be considered a luxury and expensive. But what if we compare it to RV camping? It suddenly doesn’t seem so bad and is actually a more affordable option in comparison. You may feel that owning a roof top tent allows you to drive up to somewhere, stop, camp, and then suddenly leave again. Yes you can, however in the case where you have an annex, awning attachment and perhaps a shower and toilet tent set up for example, just packing up and going could become a bit of a chore. Roof Top Tent camping does allow you to explore and get deep into areas you couldn’t normally go, so make sure you position yourself in an area where you are close to desirable areas and places you want to visit. This will make the whole experience a lot smoother giving yourself the best access to all nearby locations, without having to pack everything away every time. Of course if you don’t have all the bells and whistles and you are camping with a simple roof tent, with a simplistic fold/unfold mechanism, you probably won’t feel the burden of moving at all. For the larger models with all the attachments this is an important factor worth considering before you pitch up. After the previous factor, it would be convenient to bring up our next factor, the add on’s. Most companies now are pushing some additions to their roof tents, such as awnings, annexes, fans, clip on tables, telescopic ladders, mattresses, the list goes on and on. Some are useful, some not so much, however they may make you feel like you’re missing out on the experience without them. Try to ignore this. In my experience the Annex was the best addition I made use of, they do help to create a much more homely camping experience and also a protective shelter that hangs down over the side of the vehicle. For best effect we used to check the weather, if it had the wind coming from 1 direction it was simple enough to whip the vehicle around and set up the annex on the other side, this way we had the vehicle helping to block the wind and a nice cool annex area on the other side. Now this can be seen as a pro as opposed to a con and it’s really down to personal preference in this case. However, it is fact that you are absolutely protected from things like morning damp rising up in the mornings, creepy crawlies that exist at ground level and even larger predators that stalk the grounds for food. This is undoubtedly a pro in anyone’s book. Another pro is experiencing amazing views and stargazing from an elevated position is unlike no other experience, creating wonderful memories. Moving onto cons, those who are little nervous around heights might feel a bit jittery initially, however I can assure you after a few scales of the ladder, you won’t feel it as much. The true con that is apparent for all people across the board is bathroom breaks in the evening, having to scale the ladder up and down to relieve yourself during the night can be a cumbersome task. All things have pros and cons and well, this is the roof top tents, if you can handle that, you will love them even more. If you’re a large family you will struggle with a roof top tent, unless you are a small family of 3-4 people. The issue with roof top tents is they don’t really cater for large family get-togethers the way a 12 person Cabin Tent would and they never will. They have their own pros which we have discussed extensively, but this isn’t one of them. Directly related to sleep, you won’t find a huge mattress for sleeping on either. Remember roof top tents focus on primarily on compact, robust and mobile designs. With a weight restriction to protect your car, its implausible to cram 6-10 members in one, this will damage your vehicle. One thing that is really great that we soon realized when using a roof top tent was the storage. When you camp with a traditional pole tent, you really focus on where you will be storing your gear IN the tent. But when you are camping with a roof top tent, your vehicle becomes the storage, as it’s so close to hand. This is insanely convenient and worked really well for us, especially if you have a larger vehicle like an SUV or pickup. In addition if you have the annex attachment this creates even more space as the annexes noted in above models have very generous dimensions, commonly found in Tepui and ARB roof top tents. The weight requirements could be seen as a con but it is completely understandable. You don’t want to have a roof top tent that is already pretty heavy, then with 3 people inside it could damage your vehicle. This is where it’s very important to use a roof top tent that utilizes a strong poly/cotton base for example, these usually have a high weight capacity and won’t affect the tent or the vehicle. Another factor to consider is the roof rack and tent above, will have some effect not he aerodynamics of your car while on the road. Now the volume of effect is debatable and it’s also heavily influenced by the design of your tent. Most of the roof top tents in our list pack down pretty tight and also utilize some form of aerodynamic design. However, with some of the thicker more robust designs you might notice a deviation in your gas to mileage ratio, resulting in some additional costs in the long run. Whether this accumulates enough to be considered a con is still open for debate, its more to get you to consider the aerodynamics of your tent before buying. Another option is to use it on a trailer as it has lower elevation with better aerodynamics. A pro of roof top tents is the quality of the materials used and also the design. People are often put off by the price but don’t consider what you are actually getting for the money. The material used in these tents generally have 2-3x the waterproof protection than backpacking tents. It’s substantial and basically alleviates any concern of heavy rain. Although they aren’t strong enough to hold up tons of snow, they can definitely survive in snowy weather, absolutely. You just need to be a bit proactive and clear the snow frequently to help your tent out a bit. The bases in the top models utilize a polyurethane base that is generally mixed with cotton, this provides a really durable base and although they are in 2-3 person models, they have the capacity to hold 4-5 people. It is no surprise that nearly all the roof top tents, if not all in our list are 100% 4 season tents, allowing you to hit the road in any season, whatever the weather. We hope this was useful and unearthed what it’s really like to camp with a roof top tent, with this in mind you can make an informed decision. You can consult our buyers guide to get the low down and what you should expect from the actual tent in terms of quality and features. Share with your camping friends who are also considering vehicle camping, it may sway their decision in the right direction! Ethical Toilet Ideas for Camping | How do Camping Toilets Work?